With Share and Compare, you can share your reports directly with close family and friends to examine genetic differences. When you open Share and Compare, you’ll see a family tree. 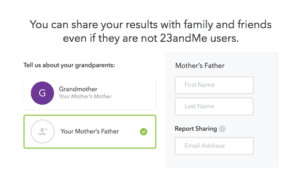 By clicking on the different relationships, you can invite family to view your 23andMe results – even if they haven’t been genotyped. You can also share your results with friends and more distant relatives. When you invite someone to share results, you have two options: you can either share all of your reports, including health and segment-level data, or share only your ancestry results. Sharing goes both ways; that is, if you share all of your reports with another customer, not only can they see all of your reports, but you can see all of their reports. Under “Manage Connections,” you can review all of the connections you have. By clicking on a connection, you can change your sharing level or choose to remove the connection. Click here to see the Share and Compare tutorial. 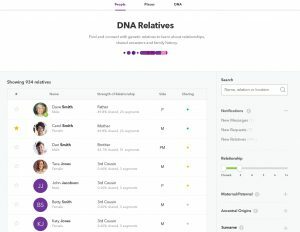 DNA Relatives (DNAR) allows you to find and connect with the broader community of 23andMe members to discover shared genetics, relationships, and family history. If you choose to participate in DNAR, you have a number of different options, which you can change any time by clicking on Update DNA Relatives Preferences. Your DNAR setting decisions only impact what information is viewable within the tool. It does not affect your broader 23andMe privacy settings. Open Sharing. If you participate in Open Sharing, you will share your full name, ancestry reports, and overlapping DNA segments with all of your DNA relatives. You can also compare your results with any of your DNA relatives that are also participating in Open Sharing. If you don’t participate in Open Sharing, you can choose to send individual sharing requests to anyone whose reports you want to compare with. Display Name. If you are participating in Open Sharing, your full name will be displayed. If you are not participating in Open Sharing, you can choose to display just your first name and last initial (Jane S), just your first initial and last name (J Smith), or just your initials (JS). Enhanced Profile Settings (Optional). You can also choose to provide additional information to help other members find you and make connections. For example, you could add a family surname, the birth country of a grandparent, or a summary of your interests. Once you’ve made connections on DNAR – either by participating in Open Sharing or by making individual connections – you can use the DNA tab to compare your connections to one another. This also means that any of your connections can compare you to any of their other connections, whether or not the other connections participate in DNAR. Your genetic data is yours to benefit from, explore, and understand. With this in mind, we offer tools for you to export and print your raw data and reports. There are many different websites and apps that will allow you to upload your raw genetic data to connect with new communities or receive different types of genetic reports. You may also want to discuss your results with a healthcare professional. Or you might want to share some of our fun traits reports on social media. Anytime you export or share information, though, it’s always important to think about who the intended audience is, and to consider the impact on yourself and relatives especially when sharing sensitive insights. You can easily edit your Share and Compare and DNAR settings from your Account Settings page. If you don’t want to receive invitations from other community members, you can block all invitations. You can also view and manage all of your connections to change sharing levels or to remove connections. It’s worth reviewing these settings once or twice a year, and taking a look at your existing connections so that you have a full picture you’re sharing genetic results with. Sharing genetic results is incredibly exciting, and you can learn a great deal about yourself by connecting with close and distant relatives. However, it’s important to be thoughtful about sharing your information. Here’s a quick checklist of things to keep in mind. Have you thought about how sensitive information could impact others? When using Share and Compare, DNAR, or sharing your results elsewhere, there’s always the chance that you could learn something about yourself or your family – such as sensitive health information – that could be upsetting. Please be sensitive to others’ right to choose for themselves whether they would like to know this kind of information. Ask the people you are considering sharing with if they’re okay learning more about your genetic reports. Have you thought about what kind of information other people can learn about you? Whenever you give someone else access to your data – genetic data or not – there’s always the risk that they might choose to share it with others. While unlikely, it’s also possible that your connections could learn additional sensitive information about your genetics if you share segments with third parties. Think about what kinds of information you would be comfortable with others learning about you whenever using any sharing tools on 23andMe or elsewhere. Are you comfortable with security and privacy of other apps/websites? Before you upload your raw genetic data to a new site or app, make sure you’re confident that they have strong security and that they will protect your privacy. Have you talked about sharing with family and friends with profiles on your account? If you have several people sharing an account, and you choose to connect with someone, you can choose which profiles in the account to share. Ask the other people who share your account if it’s okay to share their results. Have you thought about your legal rights? The Genetic Information Nondiscrimination Act (GINA) prohibits the use of genetic information to determine health insurance eligibility or premiums or for employment decisions such as hiring, firing, pay, and promotion. But, the law does not address other potential uses of genetic information, such as for determining eligibility and premiums for long term care insurance or life insurance. This is particularly important to think about with Share and Compare, and when using your genetic data on other apps and websites. Since you share genes with your family, you may want to consider how information you post could impact them as well.